Directorial missteps aside, the Aspen Opera Theater Center’s double bill of Suor Angelica and Gianni Schicchi, seen on its opening night in the Wheeler Opera House, revealed much that’s worth hearing. 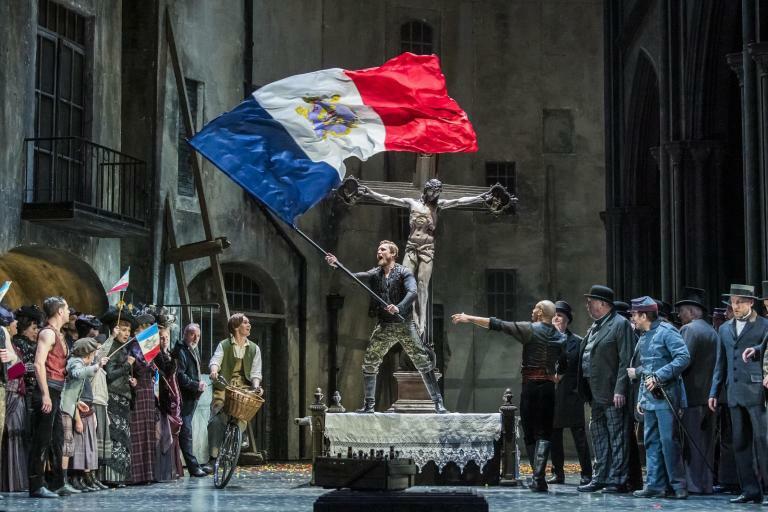 In the case of Schicchi, enough of director James Marvel’s over-the-top staging worked for a dynamic cast to score a victory. The orchestra, under conductor Tomáš Netopil, made Puccini’s music pulse with life. Setting the action in the 1940s offers a bounty of comedic opportunities for Gianni Schicchi, in which a wealthy established family enlists a scoundrel to regain the fortune denied them in the will of Buoso Donati (who dies as the opera opens). In this production Buoso is a life-size rag doll, but no matter. The living cast, without exception, threw themselves into broad comedy. Some of it was laugh-out-loud funny. As Schicchi, Calvin Griffin looked like a young Gregory Hines, had the panache to make a plausible con man, and deployed a resonant lyric baritone that suited his suave approach to the character. His stage presence held the center against a motley crew of avaricious relatives roiling about him. Chief among them, mezzo-soprano Raehann Bryce-Davis as Zita took charge both vocally and dramatically until Schicchi arrived. She also interpolated the funniest musical joke of the proceedings, holding a penultimate high note about four beats too long. The other relatives each seemed to have a screw loose—even Buoso, whom we discover had a chest of women’s clothing not mentioned in the original libretto. The one sane member of the Donati family, young Rinuccio, is in love with Schicchi’s daughter. Rafael Morales’s lyric tenor made Rinuccio’s ardent music flow winningly and matched up appealingly with Amanda Woodbury’s soprano. Her well-sung Lauretta—hardly the innocent, petulant teenager usually portrayed—began the most famous aria of the opera, “O, mio babbino caro,” with a palpable sense of entitlement, only in the final phrases supplicating to her daddy. It worked. Several voices distinguished themselves among the relatives. Soprano Lauren Michelle played Nella as a long-limbed vamp and made every phrase pay dividends. Matthew Turner’s rich baritone made a half-deaf Simone a sympathetic if cranky oldster. The opening opera, however, sank dramatically on a misguided concept. I doubt Puccini wanted his convent peopled by cruel, unsympathetic fundamentalists. This, then, provides no sisterly warmth to contrast with the cold-hearted Principessa, Angelica’s aunt, who arrives to deliver news that sends the young nun over the edge. This ripe of a story doesn’t need overly Marvel’s puzzlingly stylized action, which diluted the piece’s emotional power and kept the characters from connecting with each other. Stephanie Sadownik, who in past seasons here delivered rich comic performances as Mrs. Lovett in Sweeney Todd and Samira in Ghosts of Versailles, showed she can also be commandingly serious. Young singers are at a disadvantage in a role usually sung by mezzos approaching retirement, but Sadownik made the Principessa believably stern and resolute. Given the liberties taken with the rest of the action, it was surprising that this director staged the original ending pretty much as written. It should have had everyone weeping, but it could not top so much prior overacting. Schicchi saved the day, in more ways than one.